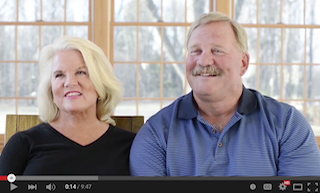 HFO Founders John and Libby Moritz reflect on the past 20 years of work through Hearts of the Father Outreach and all that has been accomplished since the death of their 3 children in 1995. 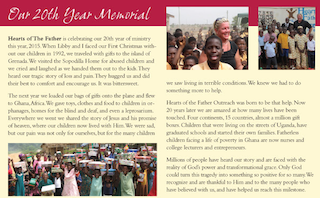 Read about our work in the latest newsletter featuring activities in Ghana, Uganda, India and more. Handel’s Messiah was presented on December 7, 2014 by Southern Berkshire Community Choir and Chamber Orchestra at Greenwoods Community Church to benefit Hearts of the Father Outreach orphans. Please enjoy the video recording of the program and remember to support the HFO Orphans this holiday season. Heart of the Father unveils a new building! “The Way Home” is a short film created in 2003 to tell how our organization began.